Are there certain things that can be considered divorce predictors? Researchers have found that there are a number of factors that will negatively affect one's chance of having a successful marriage. These "seeds of divorce" are often present even before the couple takes their vows. If a person marries as a teen, he or she is virtually guaranteed that the marriage will not last. There is no one age at the time of the wedding that will guard against divorce, though. Generally speaking, a person in his or her mid-twenties may be mature enough to embark on the journey that is marriage. However, there are individuals much older than that who cannot cope with the demands of this type of relationship. Why are cultural differences considered a predictor of divorce? Culture and religious upbringing are an integral part of a person's identity. When a couple from different cultural or religious backgrounds chooses to marry, there is little room for compromise on these basic matters. Choosing a marital partner with a similar upbringing will likely mean a more harmonious day-to-day existence. Shutting down or leaving in the face of conflict. The person who is angry becomes even angrier, and the issue is not discussed or resolved. Both parties grow to resent the other instead of working together as a team. Screaming at each other instead of having a calm discussion. Nothing gets resolved and often, one person gets frustrated and leaves. Avoiding conflict at all costs. It is normal to experience strong emotions when discussing important issues. Some couples are so afraid of conflict that difficult issues are never discussed at all. Holding back on airing grievances can lead to depression. Not all situations can be resolved successfully, however. Couples who can learn to accept that there are certain areas in the marriage where they must agree to disagree and move on have a much better chance of staying married. Without a doubt, financial difficulties cause friction in relationships between married people. Fortunately, money problems alone are not considered to be a major predictor of divorce. 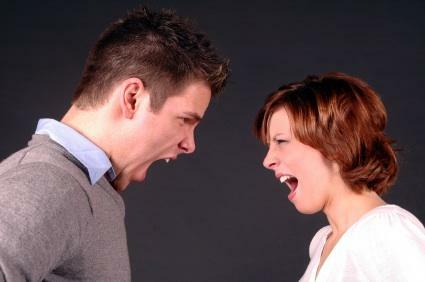 Couples may fight about money in an attempt to avoid deeper issues troubling their relationship. Money is a tool to be used. It also represents a number of other things: security, freedom, control, pleasure, self-worth, etc. Lack of money is not a good predictor of divorce. Instead, whether one person uses money to control the other or spends excessively in an attempt to boost his or her self-esteem may be a better predictor of relationship difficulties. No one factor is a sure predictor of divorce. Waiting until one is equipped to handle the level of commitment required to have a successful marriage is good advice, as is choosing someone with a similar background. After the wedding, being able to come up with a plan for resolving differences in a positive and respectful manner will greatly increase the chances that the marriage will survive over the long term.